The main street in Playa del Carmen, 5th Avenue, is a wide boulevard running north to south parallel to the sea. It’s packed with shops and restaurants ready to tempt the pocketbooks and tastebuds of every tourist. The street becomes a pedestrian-only zone each evening, not that we saw much traffic on it during the day, and is the safest, busiest and most exciting part of town. The shops along the strip are all aimed at the tourist economy, you won’t find anything truly unique here. Just accept it, Playa is a resort town. The souvenirs are plentiful; you can find everything from hammocks to maracas, even the obligatory sombrero. You can find hand-made goods there too, like gourds carved into wind chimes or hand-woven blankets. A curious thing available at at least a dozen drug stores on this single street: every erection pill on the market. They were even advertised in bold letters on signs above the door. I also noticed something available (I would guess in case the erection pills got you in trouble), antibiotics, the heavy duty kind like Z-Pak. I’m not sure about the drug prices, but the souvenir prices weren’t great deals. We even hand a shop owner call out to us and say “hey, how about you come over and I rip you off?” Amanda almost went over as a thank you for his honesty. I didn’t necessarily go to Mexico for a shopping trip. I have to admit I’m kind of spoiled nowadays and do most of my shopping online. So if I needed a sombrero I could find one on Amazon. What you can’t get everywhere else in the world is a meal experience. We had several great ones on this trip. Conveniently enough, all of the shops and restaurants accept American dollars. I recommend only exchanging for a few pesos in case you want to pick up something like a bottle of water. You can charge or pay in dollars for everything else and you don’t have to worry about getting screwed by the exchange rate. We found most stores and restaurants posted their exchange rate is and we found it consistent. The first place we ate was Pez Vela. We had been there once before on our last trip and remembered because of the swings surrounding the bar. I had an excellent Mexican grilled chicken and Amanda had a veggie burrito. The portions were generous and the bill was not too pricey for the two meals and two alcoholic beverages. We only spent about $35 which is about average for a meal out for the two of us here at home. We hit up the place for breakfast one morning had coffee and piles of toast so we would have plenty of energy for a long day in the sun. We also ate an Italian place one night. The pasta at Ristorante Romagna Mia was handmade and the service was good. The bar next door had 80s music videos playing in the background, which was a distraction, but I told myself to tear my attention away from big hair and bad graphics to share some conversation with my wife. The meal there was a little more expensive because we had a glass of wine. We also made it a point to go to one of the gelato stands. We couldn’t pass up the chance to sit and have some real gelato. I will recommend Ah Cacao at Constitution and 5th Avenue. It’s a coffee house serving good espresso and fine chocolate. We only went to one bar on our trip, and that was because they had NHL network on a big screen TV. We find something ironic about watching hockey when the weather is 86°. 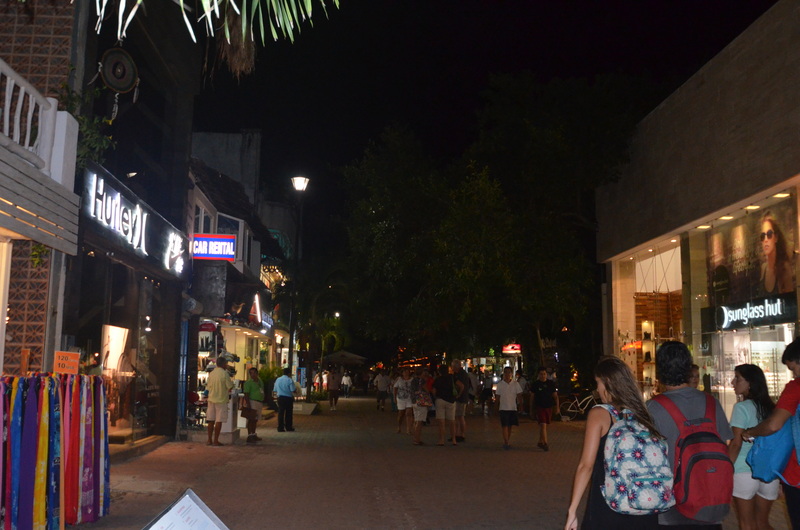 Downtown Playa del Carmen is so busy with tourists, it was always a wonderful place to take an evening stroll. If you’re people watchers like Amanda and me you will find yourself sitting at an outdoor restaurant sipping coffee and watching the families and couples stroll by. The rules about sitting at an outdoor café still apply. If someone comes up to you and offers to sing you a song or sell your flower, don’t engage or politely say no because if you don’t you’ll find yourself surrounded by a full Mariachi band and owing them an indeterminate amount of money.